In the 1950s, North American disaster research, then encapsulated within sociology, identified the lack of interorganizational coordination as a fundamental barrier to effective disaster response. Consequently, the idea of a public agency tasked with coordinating those organizations engaged in disaster response emerged. Disaster research has since grown into a multidisciplinary endeavor that has largely affirmed the importance of some type of coordinating agency during the response phase. Jurisdictions across the United States and Canada have paralleled this academic concern by including some type of disaster response coordinating agency within their bureaucracies. However, the need for coordination agencies expressed in the literature and their prominence in actual bureaucracies does not by themselves mean that coordination agencies perform a fundamental function during disaster response. Some form of hypothesis testing where the impact of coordination agencies is the main object of study is required. Yet no extensive review of disaster case studies and response frameworks has been pursued with the explicit goal of assessing the efficacy of coordination agencies in actual disaster responses. 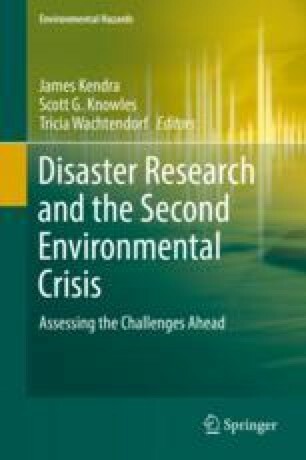 This chapter provides – to the author’s knowledge – the first such review, where the different disciplines engaged in disaster research are kept in mind. It is shown that a discrepancy exists in the disaster literature between the ‘conceptual frameworks’ of ideal disaster response and the case studies of actual disaster events; unlike the assumption of the frameworks, the case studies demonstrate that the assumed importance of coordination agencies is unfounded.